When you visit Santorini on a Greek Isles Cruise, you will discover why it is one of the hottest vacation destinations in Europe. Santorini is breathtakingly beautiful and vastly interesting. The volcanic island has a rich geological history, as well as an array of interesting archaeological sites. It has a pleasant climate, beautiful beaches, and plenty to see, do and learn. 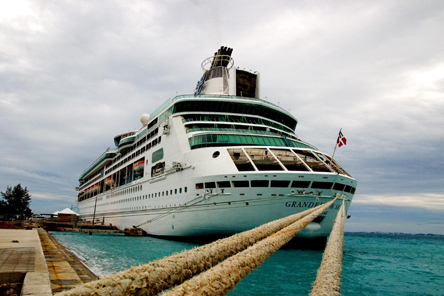 Visiting Greece on a Mediterranean Cruise is an amazing way to see this fascinating country. You will have the chance to see many different islands and cities, and you will only have to unpack once. To make things even better, you will be on a floating resort where you will have varied entertainment, great food, and interesting people to meet. Spectacular Santorini -- scene of one of the world most violent volcanic eruptions around 1450 B.C. -- is arguably the most scenically dramatic of all the Greek Islands. With its pitch-black beaches, rugged landscape and stunning caldera (volcanic crater), it is more akin to one of the Canary Islands than the Cyclades, though its whitewashed churches and clifftop houses score highly in the charm stakes. This is the island for lovers of natural beauty, though sun seekers may not fancy its beaches. Best views are from the cliffs bordering the caldera, which was formed when the centre of the island basically collapsed in onto itself. Geologists marvel at the cliffs multi-hued strata of rock, lava and pumice, so take your camera and be prepared to feel the earth move (perhaps even literally -- Santorini most recent major earthquake was in 1956). It is worth remembering that the bay surrounding Santorini is actually the world largest volcanic crater, created 3,500 years ago by a massive eruption of the Thera volcano (which is still active!). The bay is also believed by some to conceal the legendary lost city of Atlantis -- so there is plenty here to set your imagination working, even though modern-day Thera was completely rebuilt after an earthquake in 1956. If you are happy to enjoy a browse around the shops and a lazy lunch with a view, Thera will fit the bill perfectly -- and it even has some 9th-century clifftop ruins to explore. 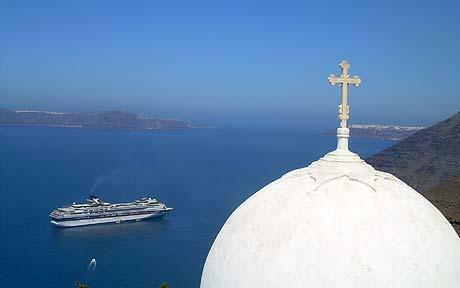 But to see the best of Santorini, you should take a shore excursion, via bus or taxi, further afield.